Students from The NewsHouse videotape an emergency drill staged along College Place. For students in Newhouse School Assistant Professor Aileen Gallagher’s “News Writing and Reporting” class, it was a real life taste of spot news. 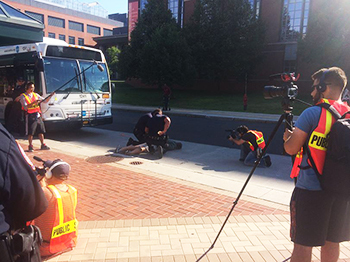 As part of a dual exercise involving emergency management, faculty and student journalists, a realistic drill played out like a Hollywood movie on College Place on the morning of Tuesday, Aug. 4. It was all an act, but it gave first responders and budding reporters a taste of the real thing. The scenario (devised by Professor Robert Silver from the Forensic and National Security Sciences Institute) involved a despondent man with a knife, and possibly and explosive device, who was noticed on a campus bus. A passenger on the bus sent a text to Department of Public Safety dispatchers, who sent officers to the scene. 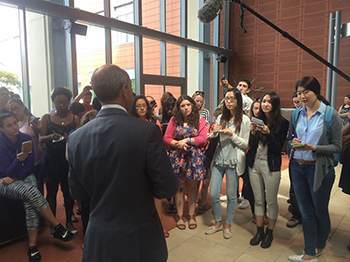 DPS Chief Robert Maldonado addresses student journalists at a post-incident news conference held at the Sci Tech building. Once there, they confronted the suspect (played by adjunct faculty member Charles Miller) and ordered him to drop his weapon. Miller turned the knife on himself before officers were able to subdue him. All the while student journalists were nearby, recording every moment and asking for details. While officers are using the exercise as a training experience, so too are the students. As part of their coursework, they’re required to file breaking news stories from the scene, along with posting tweets and a wrap-up story 90 minutes after the final news conference. Faculty from Utica College also took part, and stage makeup artists were brought in (along with a little fake blood) to make the story as real as possible for students. The entire incident was staged, but it gave students an adrenaline-pumping experience they won’t soon forget. Campus emergency drill from Syracuse University News on Vimeo.